I have been very quiet for the last month because I've been rushing to get out my Autumn collection! I'm so very proud of my first attempt at a collection and I know there is more planned (I have the next 3 started in my mind!). 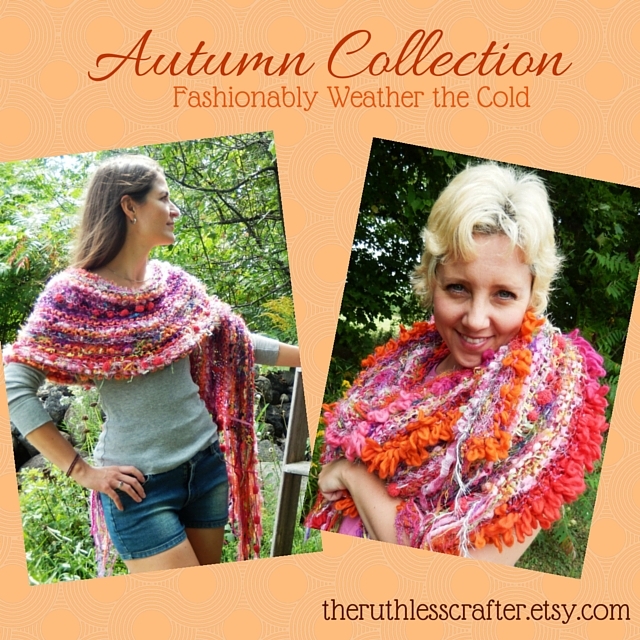 I’M SO HAPPY TO ANNOUNCE THE AUTUMN COLLECTION FOR 2015! Why put on the same accessories year after year? Your outfits are BEGGING for fresh, new fashion! Your outfits are begging for our Knit Scarves, Shawls & Wraps! For a limited time, you will be able to grab our new Knit Fashion Line made to compliment your casual, business, or nightlife outfits! We will have new colours, completely exclusive for our Fall line. If you want to take your fashion to the next level, you have come to the right place. They are limited and will be gone quickly! I urge you to sign up now (link below) so you can be the first to get the designs you want. It’s quickly approaching and you’ll want to ensure you have first pick! Just for our new customers, we have a 30% off coupon! How amazing is that?! FOR AN INSTANT 30% OFF COUPON, AND FIRST ACCESS TO THESE AMAZING DESIGNS,PLEASE SIGN UP HERE —> I WANT 30% OFF! OUR NEW AUTUMN COLLECTION WILL RELEASE ON SEPTEMBER 15, 2015! Enjoy the eCatalog - I'd love to read what you think of it! !